Electric fireplaces are completely taking over for many reasons including easy installation, low maintenance, and multiple designs to choose from. They are also far less hazardous than owning a traditional wood-burning fireplace- hence why so many people are putting electric fireplaces in place of where traditional fireplaces were. If you’re looking for modern designs, you’ve landed in the right spot. Though they fit the best with a modern designed home, there really isn’t a wrong place to have this style of electric fireplace, as they look great almost anywhere. Here’s a list of our top 5 modern fireplace picks that can make any room more vibrant and look more luxurious and cozy. The simplest things are easily the most modern because the ‘modern style’ is designed around sleek simplicity and minimalism. Wall inserts are great because they are very versatile and can go anywhere you want in a wall. They come in all shapes and sizes and look great virtually anywhere- from ground level to the middle of a wall and even in a bathroom. Side note, if you’re really looking to modernize your home you should add a black electric fireplace insert into your bathroom (if you have extra space). Put that huge picture frame to cover the wall down, the fireplace will make your bathroom one of the most luxurious places in the house. Both vertical and horizontal wall insert shapes are widely popular due to how well they fit into any household style, whether you approach a contemporary style or country chic. Really, they fit in anywhere. Tall vertical wall inserts with bold linear features can come in modern colors like platinum, slate, and black, but it’s not unnatural to go with bright colors as a contrast. And instead of what you would normally picture as flames in a traditional fireplace, the flames in a vertical fireplace will be tall and graceful, making an area even more unique. There’s really nothing more awesome than this. Everyone has an entertainment center, why not add fire to it? You can buy an insert and install it into your own entertainment center, but why waste the time? You can get yourself an entertainment center that already has a fireplace installed in the middle as the main feature! This is a classic look combined with modern aspects, considering you wouldn’t find a fireplace within an entertainment center 30 years ago. Upgrade not just your home, but your furniture as well! For the most modern of us, there are wall-mounted or inserted fireplaces that aren’t squares or rectangles. Instead, you can get them as circles and multiple other shapes. They work just like every other electric fireplace but look more original and unique- simple as that. They are a little more difficult to come across in regular stores so online is your best option. There are tons of shapes to choose from, even leaf shaped! There’s always a place for the wild at heart. A simple classic and one of the less-expensive options, a free-standing electric fireplace with a classic mantel stays in the modern genre because it never goes out of style. These are widely versatile too and easy to move, come in all sizes, and decorating options are endless. One of the most modern looks for these are of course a matte black, but turquoise or yellow seem to be huge hits as well. Your mantel can be added as part of the contemporary design- the perfect area to place your decor and change it throughout the seasons. Being highly versatile and relatively inexpensive, it makes sense why people have been opting out of using traditional wood-burning fireplaces and upgrading to modern fireplace designs. Not only will they make your life easier, but they will also increase the value of your home when appraised. In order to install an electric fireplace correctly, especially where a previous fireplace was removed in the past, you need a special set of skills and some knowledge of carpentry and electrical wiring. Both of these talents come in handy when installing a new electric burner, but there are a few things you absolutely need to know before deciding you want to do this project by yourself. If you want to install your electrical fireplace like a pro, you have to think like a pro. Follow these steps to ensure an effortless installation. Note: If you fail to understand any of the following steps, please contact a professional to help you install your electrical fireplace. Before you get started installing you’ll need to understand your clearance and the best place to put the ethanol fireplace. Ethanol fireplaces can be installed in or against combustible surfaces such as walls, but the fireplace should be at least 3 feet away from combustible materials such as furniture, paper, curtains, bedding, etc. Always check your product manual for clearance instructions for the size of the fireplace you chose. Follow the next few steps to successfully install your electric burner. Always check your installation manual – Each Electric Fireplace Burner will differ slightly. no minimum clearance to the floor. Before Installing an electric burner it is recommended to put a cover plate on your chimney (if you don’t already have one on) , to prevent the outside elements from getting in such as water. To prevent drafts and loss of heat it is recommended to close the Damper. When temperatures start to plummet and snowflakes start to fall, nothing creates a cozy living area quite like the presence of a roaring fire. The gorgeous glow and the comforting crackle give every interior a timeless elegance that can’t be replicated. Nothing is more relaxing than a plush blanket, a glass of wine, and a fire on a cold winter night. If you are looking to increase the ambiance in your living room, adding fire is a beautiful way to start. No matter if you are a traditionalist or prefer a sleek, contemporary look within your living spaces, there is a way for you to introduce this mystifying natural element into your home. A traditional fireplace imparts an old-world elegance to your interiors. Wood burning fireplaces make every single night in your living room feel like a romantic, rustic getaway. These structures add warmth to your home as well as an unmatched ambiance and a nostalgic sense of style. If your home doesn’t include an original wood burning fireplace, installing a new one is always an option. Keep in mind, installing an authentic fireplace within your living room requires a qualified contractor to remove walls, construct a chimney, install the fireplace, and craft a mantle on the surrounding wall. Although this is an expensive and invasive project for any homeowner to undertake, the results are often well worth the required costs. There are numerous benefits when it comes to constructing a brand new wood burning fireplace. Not only does the presence of a fireplace increase the resale value of your home, you can also ensure it adheres to modern energy standards and codes. Not to mention, you get the pleasure of curling up in front of a fire on cold winter nights. The presence of a traditional, wood burning fireplace also allows you to perfectly customize your mantle. No matter if you opt for sleek, white surroundings or prefer an authentically rustic look, you have the ability to design this important focal point to your exact preferences and specifications. The result is a comfortable living space that perfectly aligns with your tastes. If you want to enjoy the beauty and ambiance of a roaring fire without the hassle, expense, or upkeep of a wood burning unit, consider an electric option. These modern fireplaces are incredibly convenient and provide you with a quick, easy, and cost effective way to enjoy the beauty of fire within your living spaces. Electric fireplaces are a great option if you want to enjoy the benefits of a fireplace without any of the headaches that are often associated with wood burning models. These convenient and exceptional fireplaces don’t produce any real flames – instead, they have a realistic flame effect that can be dimmed to create the amount of light and flame you desire. Because there are no flames present, homeowners never have to worry about disposing of messy ash or other constant upkeep that comes along with traditional fire places. This also means that homeowners don’t have to worry about the safety issues or hazards associated with having a real flame present within your living spaces. Safe and easy to install, electric fireplaces are an exceptional option if you are looking to introduce the beauty of fire into your décor. They also provide you with a plethora of options when it comes to their overall design and appearance. If you are a traditionalist, install them within a classic mantel to mimic the look and feel of a rustic fire. If you prefer something unexpected, you can also find media consoles that come complete with electric fireplaces at the base. The absence of flames or vents means there is greater versatility when it comes to your design options. Another way to add fire to your living room is to install a wood burning stove. They impart a vintage, bucolic element to you home while also adding the warming glow of authentic flames. Wood burning stoves are reminiscent of a simpler time and have an antiquated elegance that makes them a pleasing focal feature of any room. Wood burning stoves provide the genuine crackle of a wood burning fire without some of the hassles of installing a wood burning fireplace. When installing a wood burning stove, it is imperative to adhere to the very specific safety requirements that are currently in place. They need to be placed at least 1-foot away from non-combustible walls or least 2-feet from standard, combustible walls. In addition, they need to be placed on an appropriate, UL-approved hearth made of concrete, brick, or other non-combustible materials. Creating an appropriate space for your wood burning stone to sit is just the beginning. A chimney must also be installed so that smoke can easily escape. Although this installation process is less expensive or invasive than installing a traditional chimney, it still requires careful consideration and the work of an approved professional. A stove’s cylindrical chimney should extend all the way to your roof so that the smoke can be properly expelled while it is in use. Although smaller than a traditional fireplace, wood burning stoves have their own unique charm. A statement-making addition to your décor, they are often made of a rich, rustic cast iron, which adds to their vintage appeal. With that said, sleek, modern options are also available if you are looking for a way to introduce a wood burning stone into more contemporary interiors. For a sophisticated and contemporary way to introduce flames to your living space modern wall mounts and fixtures powered by ethanol are a perfect fit. These sleek units have an almost futuristic look that appeals to homeowners looking to impress visitors and follow current design trends. Ethanol flames are caused by burning an eco-friendly, bio-ethanol fuel source. These flames have the same mystifying and magical appearance of authentic flickering flames, however they are a safer and more contained alternative to wood burning fireplaces. These units also do not require a vent of any kind and do not produce messy ash, making them a low maintenance option for modern homeowners who desire the beauty, ambiance, and warmth of flames without continual cleanup. While traditional-looking options are available, ethanol wall units are typically surrounded by modern elements like glass, chrome, or acrylic. These sleek materials have a crisp, modern, and sophisticated look that works well with contemporary, designer-inspired décor. You can also find sleek, glass-enclosed sconces or other small wall fixtures that allow you to elegantly enhance any living spaces with flames. In addition, tabletop ethanol units are small, portable, and allow you to place them anywhere within your home. Tabletop units can be taken outside when hosting a backyard barbeque or placed on your dining room table to add unique flair to any dinner party. These modern units are the perfect way for young, urban, or contemporary homeowners to introduce flames into their décor in an easy and hassle-free way. With winter rapidly coming, it’s time to turn one’s attention to the issue of heating. Many homeowners find their electric or gas bills skyrocketing after October because they need to turn the heat on, but a majority of those people are also overpaying. Why? Because their homes are bleeding heat through cracks, leaks, and poor construction. There are dozens of ways a structure could lose a significant amount of heat, but this guidebook focuses on fifteen. Among them are improperly sealed entryways and exits, poor insulation, unused fireplaces, and basements in general. In combating the ever present cold, it’s important not only to make sure a home is properly sealed but that the heating system in place is adequate for the amount of space. Having cracks in the walls doesn’t mean having gaping holes. For many people, a crack could be part of missing siding on the exterior of the house, worn down mortar between bricks and stones, or improperly applied plaster. Even the smallest crack can mean bigger problems are lurking around the corner, so it’s important to thoroughly inspect a home before winter comes. Many of these problems can be DIY fixes involving some extra siding, a little bit of mortar, or some plaster, but they do take some experience. Any homeowner that doesn’t know much about construction shouldn’t do these on their own and should instead contact a service for assistance. However, fixing cracks can save people lots of money in the long run since heat seeps out and the cold seeps in quickly and easily. A draft is best known as a current of cool air which somehow works its way into a fully confined space such as a room. The draft indicates that there is a leak or opening somewhere in the room that an individual might not be able to see but can feel. Drafts can come from anywhere like cracks in the walls or even just windows that are set at poor angles. The best way to combat a draft is to make sure any openings are sealed properly, the room is insulated, and any cracks in the area are sealed. If a draft is still coming in or the room still feels cold after sealing, it could mean the heating system is not up to the task of keeping the home warm. If this is the case, it might be time to look into alternative heating methods like an electric fireplace. These fireplaces are safe, easy to maintain, and powerful enough to provide extra warmth to multiple rooms when sized correctly. If curtains, sealant, insulation, and other measures aren’t enough, the investment of an electric fireplace can save a homeowner in the long run. According to the U.S. Department of Energy, a lot of older homes possess outlets which lack the proper sealing and insulation. When an outlet isn’t insulated correctly, it’s easy for cold air from the exterior to work its way inside and lower the temperature of the interior. When this happens, heat naturally gets wasted since it either filters back out through the outlet or the HVAC system needs to struggle to maintain the desired temperature. Unfortunately, most people might not be able to insulate an outlet fully without some construction experience. However, a savvy homeowner can install a plastic seal to help keep the heat inside. This seal is similar to the one shown in the picture below. It covers the electrical equipment and bare wall where outlets are typically installed and keeps the system safe. 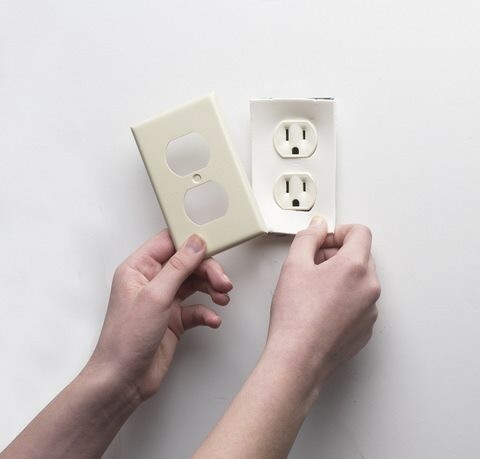 Any homeowner can install one by measuring the area around the outlets and then screwing a model that fits around them. For individuals who still have leaks even with the seals, the problem is most likely deeper in the walls. In these cases, the best course of action is to install a foam gasket. Homeowners without experience should not perform this procedure and should instead call an electrician or construction company. If one outlet is missing a foam gasket, it’s likely that the others are as well. Remember to have all outlets correctly sealed before winter sets in and heating bills rise. Chimneys are the fireplace’s doorway to the outside world, so of course winter’s cold air manages to get inside. It’s a well-known fact that cold air sinks and hot air rises, which is why hot air balloons work the way they do. If someone’s house has an open chimney during the cold months and heat is running inside the house, a natural current of air will develop that pulls the cold in and pushes the warm air out. If the chimney isn’t in use, it’s best to block it to stop the heat loss. This can be done using special doors and covers that can be installed just above the flue (the open box) or further up the chimney. These are operated simply and are relatively inexpensive, although professional installation will add to the price. Another option is a flue sealer, which is a removable plug. It’s an inflatable device made from a special plastic that will stop air movement. Neither a sealer nor a cover should be kept in place if the homeowner wishes to start a fire, but they will form air tight seals to stop the movement of air. The outside wall of a traditional fireplace should have some form of sealant where the wall buttresses the chimney. This section is frequently exposed to the elements and is another area where warm air escapes and cool air enters. The easiest way to handle this problem is to get a sealant and make sure there are no cracks or holes leading to the outside world. If the traditional fireplace never sees use and is simply a static feature of the home, homeowners should consider sealing the entire structure or getting a temporary cover to place in front of the main section. Sealing a fireplace can be expensive, but some people go the simple route and just brick up the opening. This isn’t recommended but is a cheap way to ensure the home stays warm. Otherwise, if the homeowner wants to keep the traditional fireplace open for aesthetic reasons, many stores sell covers for the front that open and close like a cabinet. People who have a traditional fireplace that they use for warmth can still be frustrated by both of these problems. If the traditional fireplace continues to be hassle because it lets the cold in or produces so much smoke, homeowners should consider replacing it with a more energy and cost-efficient model. Electric fireplaces are becoming increasingly popular in homes across the United States because they connect to a home’s preexisting HVAC system and produce all of the heat without the mess. Since they can be more easily sealed, they also don’t let the hot air escape as easily. An electric fireplace can still be aesthetically pleasing, with flames that turn on and off depending on the model. If a traditional fireplace and chimney are a continuous problem, homeowners could save time and money by upgrading. Research estimates indicate that windows and doors are responsible for 45% of lost heat in a home. Part of this problem can be fixed with simple maintenance, but the other part cannot. This is because doors and windows are made to open and close, and there will always be some form of gap or opening created. Once these entryways have been properly sealed, the other way to guarantee minimal heat loss is to not leave doors or windows open for long. Many children might remember their parents yelling at them to stop running in and out of the house or for leaving the door open for too long – and this is because the warm or cold air of the house will escape while the opposing atmosphere of the outdoors will come in. As for the first part of the problem, it’s easy and inexpensive to make sure doors and windows don’t let too much heat escape. All the homeowner needs to do is make sure there are no extraneous gaps and consider adding extra sealant as a defensive barrier. This is a pretty common problem and one that might be hard to notice at first. Quite frankly, sometimes a door is too small for the frame it is in. When this is the case, usually the frame can be rebuilt, or the homeowner can buy some sealant and apply a thin layer in the area with cracks. If the gap is between the door and the second part of the latch, then that side of the frame will need to be readjusted. An unsealed door is one that is missing some sort of protective coating around the edges or in front of it. For example, a plain door without a screen or a separate glass external door could be considered unsealed. If the homeowner cannot find any gaps in the frame but the door still exudes cold, then it might be time to consider installing an extra external door, such as a standard glass one. These glass doors tend to be thoroughly fitted and airtight to minimize the amount of heat that escapes from the interior. They can be purchased at most hardware stores. This is the same problem as having a door that isn’t fitted properly to a frame, creating small gaps that allow air to enter and escape. Window frames are usually easier to fix than a door frame, even if the solution might end up being temporary. It’s typically cheaper to take out a window, install a new frame, and then reinstall than to change out a door frame. For a more temporary solution, homeowners can use caulk or apply a sealant that expands to fit in the cracks. This is a similar issue to an unsealed door and typically requires using a little caulk or a similar substance to make sure the frame is airtight. It’s an easier fix than a window that doesn’t fit and can usually happen when the original seal around the window degrades over time. For extra protection from heat loss, homeowners can install special plastic over the interior of the window, which adds an extra defensive layer to keep heat in. It might not be the prettiest option, but it’s a common measure used by people in the northern United States and many colder countries like Canada. The words “inadequate” and “insulation” come up a lot throughout this work, and there’s plenty of reasons why. So many older homes either have insulation that wore down or simply wasn’t enough to begin with to keep the house warm. Just like the basement freezes up during the winter, so can sections of a house where the insulation behind the walls has eroded over time. Similarly, there can be problems with the roof. The roof protects people from the elements and also needs to be insulated to maintain its temperature. If it’s not, it can take on the temperature of the environment around it and, like the concrete in a basement, this cold will waft into the house. This section focuses on problems associated with the roof and general wall insulation. Most of these problems cannot be fixed as a DIY project, especially the walls. This is because removing a section of wall can release plaster dust that is harmful when inhaled, it’s possible to accidentally hit part of the central structure that keeps the house up, and insulation itself is tricky to install and usually toxic when ingested or inhaled. As for the roof, some issues can be repaired so long as the individual working has some experience. But, if a leak is not obvious or if the entire material forming the roof needs to be replaced, it’s beneficial to call in the experts. These are similar to leaks in the walls and are common in older houses or those with cheap shingle roofs. Over time, the materials wear down and can form sometimes microscopic cracks in the surface. When this happens, the cold air flows in because it is moving down and the hot air flows out. Because the house uses one complete HVAC system, the home constantly works to keep the environment warm while copious amounts of air slip away through the roof. People who suspect there might be a leak in the roof should contact a contractor or roofer to take a look. Usually if the leak is bad enough to let air in and out of the home, it will also let liquid in and that means multiple layers need to be replaced. Shingles can be inexpensive, but other materials like tar or new wood could add to the cost. If a patch can’t be applied, then an entire section could need removal. This is an odd way for heat to escape, but it makes perfect sense. Roofing materials wear down over time, even if the manufacturer claims that the roof should last for twenty years or more. When this happens, it creates more areas and passages for air to escape from. Even if the roof is perfectly intact, heat can still seep through the material because it doesn’t require an opening to leave. The thinner and more natural a material, the more likely the heat will escape. So, what can a homeowner do? If the roof is starting to wear down to the point where heat loss is a significant problem, it might be time to replace the entire roof. If this isn’t an option, an extra layer of insulation should be considered, but this can also be expensive. In a case like this, it’s important to consider whether an existing HVAC system is effective or not. How much heat is being produced, how much electricity or gas is required, and is the bill going up significantly? In many cases, it’s actually much cheaper to find an alternative heat source than try to pay for costly repairs or a new HVAC system. Homeowners frequently turn to space heaters, which aren’t the most efficient but are inexpensive to buy. Otherwise, lots of people consider new electric fireplaces, which provide heat to multiple rooms and possess new technology that keeps power usage low while still producing an incredible amount of warmth. The materials used to insulate homes vary, but they all degrade over time. So no matter whether the house has fiberglass, repurposed blue jeans, or foam, it will slowly start to be less efficient and effective over time. When this happens, heat loss is common. Old insulation can also invite unwanted visitors like rodents, so it’s important to make sure the home is fully protected. Reinsulating a home is expensive because the material needs to go behind the plaster of the walls. It’s best to call a construction company and receive an estimate before committing to this kind of work. In the meantime, individuals can keep the house warm by investing in alternative heat sources such as a space heater or a small electric fireplace. Finally, there is inadequate insulation. This is what happens when the people who built a house simply didn’t put enough material between the walls to keep it warm in the cold months and cool in the hot ones. This problem is a little difficult to identify since the regular homeowner is not able to see behind the walls without removing a section. One way to test and see if the walls are a cause for concern is to place one’s hand on a wall that has an external side. If the temperature is much colder than the rest of the house, then poor insulation is the most probably cause. Similar to needing to repair old insulation, fixing inadequate insulation is a costly procedure that takes a lot of time and materials. Homeowners will need to budget and save up before calling a construction company. In the meantime, it’s recommended that people turn to an alternative heat source. To prevent further loss, the heat source should be used in a room that can be closed and doesn’t have external walls. Basements are naturally cold places. The majority of the low temperature comes from the walls being in constant contact with the ground outside. The earth beneath the thin layer of topsoil that humans see every day is natural chilled and damp. The low temperature drastically changes the temperature of a basement’s concrete walls, and the moisture seeps into the structure and the air and makes people feel colder. Even worse, a study in Canada discovered that the temperature of the basement can lag behind the rest of the house by a period of 69 days. What does this mean? It means that even when spring arrives, it will take 69 days for the basement to move out of its winter temperatures. This is a long time to wait for an entire floor in a home to be comfortable and usable. For homes with basements, cold, especially on the ground floor above the basement, will always be an issue. What a basement – or a cellar – really is, is a giant room with poor insulation, low heating, and many issues for homeowners to deal with over the years. When it comes to fixing these problems, repairs and construction can get expensive fast. Below are the two major causes for cold air leaking into a basement and what the average homeowner can do to handle them. This is the biggest source of heat loss in any home and can extend to the upper levels. Concrete is not a good insulator. As a form of stone (or at least a compound) it is often cold and easily takes on the temperature of the environment around it. Without sunlight and with the constant pressure of the ground around it, concrete walls in the basement will always emanate cold. To avoid this, homeowners need to thoroughly insulate their basement. Once a house is built, it’s nearly impossible to add insulation to the outside of a basement. So, they need to work on the inside. The best way to do this is by constructing finished walls. A finished wall will feature some form of professional construction insulation made of foam or fiberglass. Anyone who ever lived in a home with an unfinished attic will be familiar with this material. Old fiberglass insulation was often a bright bubblegum pink and filled with sharp shards that get stuck in the fingers. But it keeps the temperature in well. Newer insulation is a foam that is sprayed onto walls and hardens quickly. Insulation can be applied, with some preparation, over the concrete. A construction company can then build another wall using wood and plaster to form a tight, appealing seal. This is an undertaking that shouldn’t be done lightly. Finishing a basement can be expensive, costing between $10,000 and $30,000. Some people choose to just spray on a foam insulation, but this can be dangerous if children or pets mess around with the material even once dry. Other options to keep the area warm are to install a carpet, use space heating, or even add a fireplace to keep the basement at a comfortable temperature when in use. Believe it or not, one of the best heating sources for any home is an electric fireplace. They form a separate part of an HVAC system but can provide warmth in a cost-effective and resource efficient manner due to their build and technology. Many fireplaces are simple and relatively inexpensive to install and bring consistent heat to several rooms. Individuals can even turn the flames on and off in some models and spring for a variety of add-ons to not only make the fireplace a source of heat but also a beautiful decorative feature. Electric fireplaces can be installed everywhere, even outside. For homeowners who had consistent drafts, leaks, frigid basements, and other issues, adding one of these structures can keep the house warm no matter what the weather is like outside at a fraction of the cost of renovating and running a brand new HVAC system. Here at Ventless Fireplace Pros we have created an ultimate guidebook to help you find your perfect fireplace. Our guidebook will provide you with comprehensive information about ventless fireplaces and help answer any questions you may have. Ventless fireplaces are an elegant and affordable way to add warmth and beauty to a home or apartment. There is no chimney or ventilation duct to the outdoors, so they are easily installed in any room. Some models can even be moved from room to room! Ventless fireplaces are reasonably priced, and adding one to an existing residence doesn’t require an expensive installation process. There are several different types of ventless fireplaces, but the two main types we carry at VentlessFireplacePros.com are electric and ethanol. Electric fireplaces use electricity to produce heat and simulate a flame, while ethanol fireplaces actually burn ethanol fuel to produce a real flame and heat. Some ventless fireplaces are freestanding units that can be placed anywhere in your home, while others are permanently installed in a wall. Many units produce an actual flame, while others simulate flame with electricity. Electric fireplaces will need a standard 120-volt power outlet, and some wall units can be directly connected to your home’s electrical wiring during the installation. Most ethanol fireplaces use inexpensive and convenient fuel packs to fill an internal tank. Both types of fireplace are very safe - there are strict federal regulations as well as industry group standards setting safety standards for ventless fireplaces, ensuring that installing a ventless fireplace is a safe and healthy addition to any home. Ethanol fireplaces have built-in carbon monoxide detectors and devices which monitor the oxygen level in the room, and automatically shut off if the air quality in the room declines. The primary purpose for a ventless fireplace is to make a room cozy and attractive. Although ventless fireplaces, particularly electric models, can provide a wonderful level of warmth in a room, they are not intended as a main heat source. In purely practical terms, ventless fireplaces can be thought of as a much more attractive space heater. However, unlike a conventional fireplace which lets most of the heat go right up the chimney, ventless fireplaces keep all the heat right where you want it. In small spaces, this may be all the heating you may require. In this guide, we will look more closely at how ventless fireplaces work, what they can do to make your home warmer and more inviting, the benefits and drawbacks of the various ventless fireplaces, the best manufacturers, and how to safely maintain your fireplace. We carry both electric fireplaces and ethanol fireplaces here at VentlessFireplacePros.com. Electric fireplaces have been around for many years, and they use electricity to create both a visual simulation of fire as well as heat. Ethanol fireplaces are newer, and they burn ethanol fuel in order to produce real flames and heat. Neither type of ventless fireplace requires a connection to the outside air. Electric fireplaces come in a variety of different types. Some units, generally at the higher end, are installed directly into a wall and wired into your home’s electrical system, while other types are portable and can be plugged into any standard 120-volt outlet. There are electric fireplaces that display a simulated flame using a video screen, while other fireplaces use artificial logs and LED lights to simulate the fire. There are even electric fireplaces that use water vapor to mimic smoke. Most electric fireplaces have an actual heating unit so that they produce heat; these units generally allow you to shut the heating element off so that you can enjoy the visual ambience of a fire without heating the room. This is a great feature on warm evenings, allowing you to have the atmospheric effect of a burning fire while staying comfortable and cool. Ventless electric fireplaces come in seven basic form factors. An electric stove, also known as a portable fireplace, is a highly transportable electric fireplace that is very easy to move from place to place. All that you need to do is carry or wheel it to where you want some extra heat and ambience, plug it into the wall, and turn it on. Portable fireplaces are ideal for small rooms that lack central heat, cold basements, and anywhere in your home that just needs some more warmth. Some electric fireplaces are built into a storage cabinet, TV stand, or media console area, allowing you to save on floor space by combining two functions into one. Furniture units aren’t quite as easy to move around as portable fireplaces, but you still only need an electrical outlet to have your electric fireplace up and running. Electric Wall Fireplaces can be built right into or placed on your existing wall. Recessing your fireplace into your wall does require some installation work – basically just cutting the drywall and possibly running wiring – but gives you the ability to have a built-in electric fireplace anywhere in your home. For wall hanging fireplaces there is much less installation work involved - just attach them to the studs and plug it in. Wall fireplaces come in a variety of styles, from plain and functional to extremely elegant. A mantle fireplace unit combines a wall-mounted fireplace with a stylish storage area above. They are excellent for limited space, or in homes where you aren’t able to open up a wall, such as a rental or apartment. There is a wide range of mantle designs available to fit with your decorating style. Mantles are very flexible in where they can be placed – you can put one above a sofa, in a hall, in a cold bedroom, or under a picture window. Electric Corner Fireplace Units are similar to portable fireplaces but are specifically designed to fit into a corner space. Ideal for those looking for some added warmth but lacking in wall space, corner units let you make the most of the space you have. If you have an old-fashioned vented fireplace but don’t want the hassle of chimney cleaning and maintenance or the fire risk posed by creosote buildup, an electric fireplace insert which slides right into your existing fireplace opening is a great solution. These inserts are a safe and beautiful way to use your existing room design while creating warmth and comfort. Ethanol fireplaces use clean-burning, environmentally friendly ethanol fuel packs to produce a real, tangible, physical flame. These fireplaces can be mounted inside or on a wall, on a table top, or can be portable standalone units that go anywhere you would like to have some warmth. Because ethanol fireplaces produce an actual flame, they cannot be used for ambience only; they always heat up the room they are in. They also emit water vapor and use up oxygen as part of the combustion process; while neither of these is generally a major issue, you should be aware of the need for some airflow into any room where an ethanol fireplace is being used. There are six basic form factors for ethanol fireplaces. Ethanol Wall Fireplaces mount directly onto an existing wall and come in a variety of unique and elegant designs. Wall units are great for areas with traffic, as the flame is completely contained inside a glass partition, and can be used even in areas open to the public such as restaurants or waiting areas. Some wall units protrude from the wall while others are built into a recess, so the amount of work necessary to install them can vary. Some wall units require clearance between the back of the unit and other structural elements (such as studs or drywall) while other units, known as “zero clearance” fireplaces, are insulated so well that they can be in direct contact with the rest of your house. Tabletop fireplaces take the ventless nature of ethanol fireplaces to its logical conclusion. With no need for ventilation hardware, the flame can be literally anywhere in the room. Tabletop displays come in a range of beautiful designs that make fantastic centerpieces for dining tables, astonishing conversation pieces in a living room, or practical yet elegant statement pieces on a corporate desk. Freestanding fireplaces or floor units combine a heat source and an elegant decorative touch in one convenient package. There is a wide array of designs, ranging from huge firepit-type models to tall and slender pillars of flame. Some are quite small while others can heat an entire patio area. An ethanol burner is the simplest form of a ventless ethanol fireplace, and it’s intended as a purely functional item to provide supplemental heat in a small area. Burners are just the flame-generating component without any fancy hardware or display elements, and they can be installed almost anywhere. You can install a burner in an old-fashioned fireplace, repair or refresh an older ethanol fireplace’s burner component, or use a burner to make a do-it-yourself fireplace. Fireboxes are an interesting combination between floor and wall units. As the name implies, in design terms they are a simple box containing the flame – some are more polished and shiny while others are simpler, but all of them are basically just rectangular boxes. They can be installed next to a wall, inset into an existing fireplace, inset into a custom alcove, or even left freestanding. Smart fireplaces are fireboxes brought into the digital age. Similar in design and appearance to a conventional firebox, the smart firebox has built-in digital technology allowing you to control the flame from the included remote control, or using your own smartphone. Ventless fireplaces provide a wide range of benefits, adding comfort and value to any room of your home. A fireplace adds warmth and a glowing ambience to the room. First and foremost, ventless fireplaces are attractive both as furnishings and objects in your home, and as a source of warmth, light, and ambience. People love the sight of a fire, and love to feel the heat coming from the flames. A room with a ventless fireplace is a room that is cozy, homey, and comfortable. One of the largest benefits of ventless fireplaces is an obvious one – ventless fireplaces do not need to be ventilated to the outside of the building. If you want to add a conventional fireplace to your home, you have to build a chimney stack, or connect the fireplace to the ventilation system – a difficult, time-consuming, and above all expensive proposition. Adding a traditional brick and mantel fireplace to an existing home can cost more than $30,000 for permits, inspections, materials, and labor. Vented gas fireplaces are less expensive than that, but will still run at least a few thousand dollars in installation costs. Ventless fireplaces avoid all that hassle and expense because they require no or minimal connections to existing construction. Because they don’t need a direct vented connection to outside air, ventless fireplaces can be used anywhere in your building – or even on your patio, carport, or garage. That conventional fireplace you spent five figures installing only goes to one place – if you want to move it to another room, you’re out of luck. You can put ventless fireplaces in any room of your house, or in multiple rooms – the choice is entirely yours and it’s easy to change your mind later and move things around. Some ventless fireplaces use electricity to produce heat and simulated flame, while others burn bio-ethanol fuel to produce a real flame. Either way, there are no toxic or smelly emissions from ventless fireplaces, no soot, no smoke, no odor – the only emission from a ventless ethanol heater is a little bit of water vapor, and electrical fireplaces produce no emissions whatsoever. People with asthma or allergies to smoke, or who dislike the smell of wood smoke, can enjoy ventless electrical fireplaces without any health risk or discomfort. Unlike conventional fireplaces, ventless fireplaces require only simple cleaning and occasional inspection of safety components. This low maintenance requirement means ventless fireplace owners spend their time enjoying their fireplace, not carting wood, cleaning chimneys, and taking care of yet another household chore. Unlike a conventional fireplace, where it is difficult to control the level of the fire more than very roughly, ventless fireplaces give absolutely precise control over heat and light output. Electric fireplaces, where the heating element and the lighting element are completely separate systems, even allow users to have the visual appeal of a roaring blaze, while putting out no heat whatsoever – ideal for a summer evening. Ventless fireplaces are environmentally responsible, using clean electricity or bio-ethanol produced from crops. They are also energy efficient – while a conventional fireplace sends all or nearly all of its heat right up the chimney (heating a small area around the fireplace through radiant heat, but cooling the building overall), a ventless fireplace keeps all the heat inside the building. With no ventilation taking the heat out, that warmth stays right where you want it to be. When you want extra heat in a room, a ventless fireplace lets you warm that area without having to turn on the furnace for the rest of the house, or turning up a thermostat which may cause other rooms to be too hot. Ventless fireplaces allow you to target heat to where you need it the most, and many models are highly portable, allowing you to reconfigure your heating system to your changing heating needs. Ventless fireplaces are easy to install. The most involved installations only require you to remove some drywall and possibly wire the fireplace into your home’s electrical system; many ventless fireplaces are completely portable and all you need to do is plug them in or carry them to the room you want them to heat. Traditional fireplaces create untold health and safety risks – creosote buildup can lead to home fires, as can embers escaping from crackling logs, while smoke and other toxic residues are the inevitable byproduct of wood combustion. Ventless fireplaces avoid all these risks, and those fireplaces that do rely on the combustion of safe, clean bio-ethanol come equipped with sophisticated air quality monitors that ensure any degradation in the oxygen quality around the fireplace will cause the fireplace to shut off. Every type of fireplace has advantages and disadvantages, and electric ventless fireplaces are no exception. The largest drawback of an electric fireplace for some people is that there is no real flame, only a simulated flame. The level of quality of the simulated flames varies from manufacturer to manufacturer and from unit to unit, but most people can tell that it isn’t a real flame. Many electric fireplaces also do not produce the crackling sound of a real fire (although some units do come with a device to make that sound) and the ambience of an electric fireplace, although pleasant and cheery, is not quite the same as having a real flame. However, some manufacturers have taken this perceived disadvantage and have designed their ventless electrical fireplaces to put on a bright and cheery multicolored display, rather than try just to copy a natural flame, and many people like those displays very much. Although electric fireplaces are relatively efficient compared to a conventional fireplace (where most of the heat ends up going up the chimney or out the ventilation system), they are of limited capacity and are not intended to be the primary heat source for any but the smallest of spaces. Electric fireplaces can be used on a standard wall outlet, but they do tend to draw a lot of amperage from those outlets and may have a difficult time sharing an outlet with other power-hungry appliances. You may need to purchase a surge protector, and for larger units you may need a dedicated circuit to prevent blown fuses. Finally, because they run on electricity, electric fireplaces will not work during a power outage such as during a winter storm. During weather emergencies, they may not be reliable providers of heat, so you should not depend on an electric fireplace as your primary heating source. Although ethanol fireplaces are an excellent addition to any home, like any other product there are some tradeoffs that you should be aware of. Because ethanol fireplaces burn ethanol to produce a real flame, the rooms they are in do need to have adequate ventilation. The fireplace itself does not require a specific vent, but using an ethanol fireplace in a tightly enclosed space with no ventilation will cause a buildup of carbon monoxide as a natural byproduct of combustion. Ethanol fireplaces come with air quality monitors to prevent dangerous levels of carbon monoxide buildup but this is something to be aware of when deciding where in your home to place an ethanol fireplace. The other byproduct of combustion in an ethanol fireplace is water vapor. In homes with very poor ventilation, this may potentially increase the chance of problems such as mold or mildew. However, even marginal levels of ventilation should be more than enough to prevent water vapor buildup from being a significant issue in a modern home. Ethanol fireplaces cannot produce a flame without producing heat. If you want a nice fireplace experience in the summer months, with an ethanol fireplace you have to put up with the heat coming from the fireplace. Unlike with an electric fireplace, there’s no way to get the visual impact of the flame without the accompanying warmth. Speaking of flames, the flame produced by burning ethanol is slightly bluer in color than the flame that one would expect from a wood fireplace, which may be less appealing to some owners. However, the addition of fire elements such as ceramic logs and glass embers to an ethanol fireplace can cause these flames to look more “natural”. Finally, although they will work during power outages or storms, ethanol fireplaces do burn physical fuel, meaning that you have to buy and store the fuel, refill the fireplace, and pay the ongoing operating expense of running the fireplace. The cost to run an ethanol fireplace is somewhat higher than the cost to run an electrical fireplace for the same heat output. There are a number of manufacturers of very high-quality electric and ethanol ventless fireplaces. VentlessFireplacePros.com has had excellent results with fireplaces from these manufacturers. Ignis is a manufacturer of electrical and ethanol ventless fireplaces based in New York state, and they also produce their own line of bio-ethanol fuel and sell a variety of fireplace accessories. Ignis makes the “Royal” line of electric wall-mounted fireplaces. The Royal line ranges from 36” to 95” in length, and is available with a simulated flame bed of crystals, pebbles, or logs. The enclosure comes in a choice of white or black, and the Royal fireplaces can come without a heater or with a two-setting electric space heater (750 watt and 1500 watt) built-in. There is an overheat protection sensor and the flame effect has four different levels of brightness. Ignis produces a line of Zero Clearance fireplace insert fireboxes, a unique insulated double-wall ethanol burner that only passes heat through the glass front, so it can be installed without any clearance whatsoever. Ignis also builds recessed, wall-mounted, freestanding, and tabletop ethanol fireplaces and fireplace burners. Nu-Flame manufactures bio-ethanol ventless fireplaces and produce a line of bio-ethanol fuel and ethanol fireplace accessories. Nu-Flame has a wide array of unique tabletop fireplaces, ranging from elegant to industrial in design. They also have a line of beautiful free-standing floor fireplaces that can be the design centerpiece of an entire room, as well as sleek wall-mounted fireplaces. One of the most unique Nu-Flame designs is the Ardore tabletop fireplace. A refined black cover atop a stainless steel burner, the Ardore produces a warm burst of flame between two tempered glass panels which reflect the fire. The flame is easily adjusted, and the Ardore weighs just over 17 pounds, making it easy to move from room to room. Another outstanding Nu-Flame product, the Fiero freestanding floor fireplace can be the center of any room. Constructed of tempered glass and stainless steel, the Fiero is distinctive and beautiful and makes any room pop. The Fiero is also available with white or grey ceramic pebble or log inserts to produce a more natural-looking flame. Amantii manufactures high-end electrical fireplaces in a variety of styles and designs, along with electric fireplace accessories. Many Amantii designs are absolutely unique and beautiful, especially their line of three-dimensional electric fireplaces where the flame is visible from three directions. The Amantii Panorama Deep XT series of built-in wall fireplaces range in size from 40” to 88” and have the special Amantii “Fire and Ice” three-color display, allowing you to choose from several different color combinations. The Deep XT series also comes with a beautiful selection of logs, embers, and glass pieces to create a convincing illusion of flame. The heating element is able to heat a 450-square-foot room. Amantii’s True-View XL line has the ability to display flames on up to three sides at once. The True-View XL fireplaces can be installed with all three sides open, with the front and the left open, with the front and the right open, or with just the front open for an extra-deep fireplace. Ranging from 40” to 72” wide, this line of fireplaces is a truly beautiful addition to any room. Eco-Feu is a Canadian manufacturer of bio-ethanol ventless fireplaces based in Montreal. They also produce bio-ethanol fuel and ethanol fireplace accessories. Eco-Fue produces refined-looking tabletop fireplaces, elegant wall-mounted fireplaces, unique freestanding floor fireplaces, and utilitarian ethanol burners. One interesting Eco-Feu design is the Romeo tabletop biofuel fireplace. Built around a stainless steel ethanol burner, this cylindrical glass fireplace is attractive and durable and features a flame height of up to 7 ½”. The Romeo can be used indoors or out, and is built with high-temperature glass for extra safety. The Romeo is completely self-contained, and weighing just 14 pounds, is easy to move from room to room. A large fuel reservoir allows for burn times of up to eight hours per fill. The Eco-Feu Vision III free-standing biofuel fireplace has an intriguing design based on stainless steel and glass that offers beautiful and portable heat and ambience wherever you need them. Made with tempered safety glass and featuring an automatic convection system and shutter mechanism, the Vision III is suitable for both indoor and outdoor use and can burn for six to eight hours. Maintenance on an electrical ventless fireplace is extremely simple and consists primarily of inspecting the electrical connections to make sure the cord and plug aren’t frayed, and doing some basic cleaning. You’ll need a clean soft cloth, glass cleaner, and a vacuum cleaner with a brush attachment, or a handheld vacuum. Unplug the fireplace; if it has been operating recently, let it cool off completely. Some internal components can get very hot and you do not want to burn yourself. Check the electrical connection components – the power cord, the plug, and the connection to the fireplace itself – for fraying or wear. Do not use your electric fireplace if any of the electrical connections are frayed or worn. Use a clean, soft cloth to wipe dust or debris from the interior and exterior surfaces of the fireplace. Use a handheld vacuum cleaner or a small brush attachment to a regular vacuum cleaner to clean off the heat vents (where the hot air comes out of your fireplace). Finally, use glass cleaner (not an abrasive cleaner, which might scratch your glass!) to clean the inside and outside of the glass panel(s) of your fireplace. You may need to remove the panels from the fireplace, depending on the design of your fireplace, in order to reach both sides of the glass. You should repeat this maintenance cycle perhaps once every three months; do maintenance more often if you are in a dusty environment, are using your electric fireplace heavily, or notice debris building up anywhere on the fireplace. If your electric fireplace uses a lightbulb or set of LED lights to simulate a flame, those lights will need to be replaced periodically if they burn out. Ethanol ventless fireplaces require a bit more maintenance than their electrical counterparts, but are still a very low-maintenance piece of hardware. You’ll need a clean cloth, a can of compressed air, glass cleaner, and a vacuum cleaner with a brush attachment, or a handheld vacuum. Turn the unit off and let it cool off for at least half an hour. Remove the ceramic logs or other inserts used in the fireplace and wipe them with a clean damp cloth to remove any soot or buildup. Check the logs for blackened areas, which might indicate that the log is getting too much direct heat; clean the blackened areas off and rearrange the logs so as to distribute the flames more evenly. Check the air inlet holes, where oxygen is drawn in from the room to mix with the bio-ethanol fuel, and make sure they have not become clogged with dirt, dust, or debris. Use the can of compressed air to blow the burner tube clear of any debris that might be blocking the flow of ethanol to the burner. Vacuum the base of the unit to get rid of any dirt or debris which could build up and pose a fire hazard. Clean both sides of all glass panels; you may need to remove the panels from your fireplace to gain access to them for cleaning. Inspect the air quality sensors in your ethanol fireplace and make sure that they are functioning. You should perform this maintenance checklist on your ethanol ventless fireplace every three months or so; if you notice a lot of buildup or are using your fireplace frequently, do maintenance more often. That’s it! Your electrical or ethanol fireplace is now ready to go back to work, heating your home and making it a more comfortable and appealing place to live. Ventless fireplaces are in general extremely safe products for your home – they are certainly much safer than conventional fireplaces. However, there are some basic steps which you should take to ensure that your ventless fireplace poses no risk to your home and family. For electrical fireplaces, make sure there are no electrical hazards around your fireplace. Your fireplace should not be situated near any source of water – sinks, water heaters, or water features are all things to keep your fireplace away from. Make sure that the cord is not positioned where it will be regularly stepped on, creating wear on the cord. Electrical fireplaces also draw a lot of current, and it’s critical that you have a circuit for the electrical fireplace that can handle the load. Don’t put other high-drawing appliances or equipment on the same circuit as your fireplace – and remember that a given circuit can have more than one outlet, so don’t assume that two different outlets must be on two different circuits. Keep flammable objects away from your ethanol or electric fireplace – fireplaces of any sort generate a lot of heat, and the ethanol types have an open flame. The area around your fireplace needs to be kept clear of flammable objects such as books, papers, pet beds, etc. Keep your fireplace clean, in and out. Dust buildup can pose a fire hazard. Use the maintenance guide in Chapter Six to keep your fireplace free of this fire risk. Ethanol fireplaces have built-in air quality sensors that will automatically shut the fireplace off if there is a drop in the oxygen concentration or a dangerously high carbon monoxide buildup. For maximum safety, you may wish to install a separate air quality sensor with an audible alarm in any room with an ethanol fireplace in operation. Make sure that your fireplaces are approved by Underwriter’s Laboratories (UL) in the United States, or Underwriter’s Laboratories of Canada (ULC) in Canada. The UL or ULC label will appear prominently on the back or side of the fireplace if it has been approved. Ethanol fireplaces protect people in your home from being burned by using safety glass around the flame elements. However, the glass itself can still become quite hot – don’t allow children or pets to play around floor units, and make sure that tabletop units can’t be easily pulled down by an inquisitive child or rambunctious pet. Do NOT refill your ethanol fireplace while it is still burning! Put the fire out and allow the burner to cool off before adding more fuel. Use a long match or long-reach butane lighter to ignite your ethanol fuel – NEVER use a Bic lighter or a regular match. Keep your hands and face well away from the combustion area of your ethanol fireplace. If you spill ethanol fuel on your skin or clothing, wash it thoroughly before attempting to light the fire. Make sure that the ethanol fireplace you choose has a spill tray underneath the burner, so that any spilled fuel will not create a fire hazard. Hopefully you now know more about ventless fireplaces than when you started this guide, and that means it is finally time to get out there and choose the fireplace that is perfect for you!